Select cdl lock sw, cdl unlock sw in data monitor mode. NO >> Refer to DLK-97, "Diagnosis Procedure". Check signal between main power window and door lock/unlock switch harness connector and ground using oscilloscope. Check continuity between bcm harness connector and main power window and door lock/unlock switch harness connector. Refer to dlk-98, "component inspection". Select INTELLIGENT KEY of CM using CONSULT. Is the inspection result normal? Yes >> front door request switch is ok.
No >> refer to dlk-100, "diagnosis procedure". Disconnect malfunctioning front door request switch connector. Check voltage between malfunctioning front door request switch harness connector and ground. Check continuity between malfunctioning front door request switch harness connector and bcm harness connector. Check continuity between malfunctioning front door request switch harness connector and ground. Refer to dlk-101, "component inspection". No >> replace malfunctioning front door request switch. Check continuity between malfunctioning front door request switch terminals. No >> refer to dlk-102, "diagnosis procedure". Refer to dlk-103, "component inspection". Select FLASHER in ACTIVE TEST mode. Touch LH or RH to check that it works normally. NO >> Refer to DLK-105, "Diagnosis Procedure". Refer to EXL-105, "Component Function Check". Check intelligent key relative signal strength. Confirm vehicle Intelligent Key antenna signal strength. Select вЂњINTELLIGENT KEYвЂќ of вЂњBCMвЂќ using CONSULT. Select вЂњrke ope coun1вЂќ in вЂњdata monitorвЂќ mode. Rke ope coun1 Check that the numerical value is changing while operating on the intelligent key. Is the inspection result normal? Yes >> intelligent key is ok.
No >> refer to dlk-106, "diagnosis procedure". Check by connecting a resistance (approximately 300ù) so that the current value becomes about 10 ma. Refer to dlk-200, "removal and installation". Is the measurement value within the specification? Yes >> replace intelligent key. No >> replace intelligent key battery. Select indicator in active test mode. Touch key ind or key on to check that it works normally. Is the inspection result normal? YES >> Key warning lamp is OK.
NO >> Refer to DLK-107, "Diagnosis Procedure". Refer to DLK-31, "WARNING FUNCTION : System Description". Select rke ope coun1 in data monitor mode. No >> refer to dlk-108, "diagnosis procedure". Check continuity between bcm harness connector and remote keyless entry receiver harness connector. Check voltage between remote keyless entry receiver harness connector and ground. 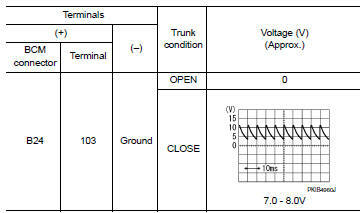 No-1 >> check 10a fuse no. 14 [Located in fuse block j/b]. No-2 >> repair or replace harness between bcm and 10a fuse no. 14. Check continuity between remote keyless entry receiver harness connector and ground. Is the inspection result normal? YES >> Replace remote keyless entry receiver. Refer to DLK-199, "Removal and Installation". Select LCD in ACTIVE TEST mode. Touch set p to check that it works normally. Is the inspection result normal? Yes >> shift p warning lamp is ok.
No >> refer to dlk-110, "diagnosis procedure". No >> refer to dlk-111, "diagnosis procedure". Regarding wiring diagram information, refer to dlk-63, "wiring diagram". No >> refer to dlk-113, "diagnosis procedure". NO >> Refer to DLK-115, "Diagnosis Procedure". Is the inspection result normal? Yes >> go to 3 no >> repair or replace harness between bcm and trunk lid opener assembly.